Do not buy this app unless you are a professional piano technician. This is a professional tool that produces a custom piano tuning for any piano. It is part of our popular TuneLab line of piano tuning programs for Smartphones, tablet computers, and laptops, which piano technicians have been using for more than 15 years. Notable features: * Capable of an accuracy of 0.02 cents. * Measures and uses inharmonicity of the piano to construct the tuning. * Provides an over-pull mode for more accurate pitch-raises. * Can store hundreds of tuning files for individual pianos. * Tuning files can be stored locally and in the Cloud on Dropbox. * Provides many historical temperaments for period music. * Switches notes automatically when you play the next note. * Provides a strobe-like Phase Display for fine-tuning. * Provides a versatile frequency spectrum display. TuneLab lets you customize a tuning by sampling the inharmonicity for a few notes of the particular piano. You can choose the kind of tuning stretch you want, based on octaves, double-octaves, or other intervals. Then you start tuning. After a custom tuning has been created from inharmonicity measurements you can store this tuning by name. The next time you need to tune that piano, or one very much like it, you simply load that same tuning file and start tuning. There is essentially no limit to the number of tuning files that you can save. TuneLab comes with some sample tuning files and an "Average" tuning file so you can start tuning right away without bothering to measure inharmonicity. TuneLab covers the normal piano range from A0 to C8 (88 notes). The automatic note-switching feature makes it possible to enjoy hands-free operation. TuneLab switches up to 3 notes up or down from the current note. There is also easy one-touch manual note switching. TuneLab has two different displays that are visible at the same time. One is the Phase Display. This is a band where black squares move left or right. You tune to make the squares stop moving. The other is a Spectrum Display. This is a graph that shows a peak in the frequency spectrum for every pitch present in the sound. 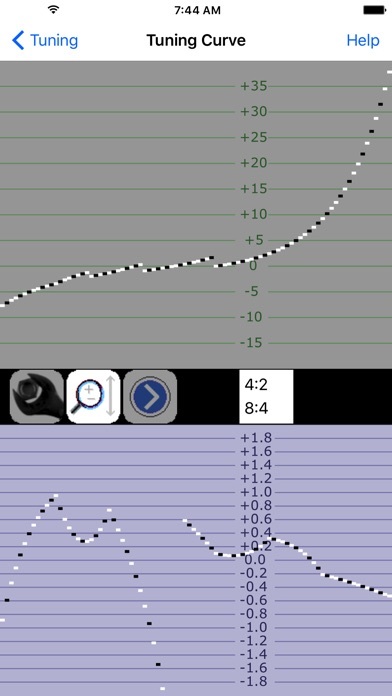 You tune to make a peak in the graph move to a central red line. 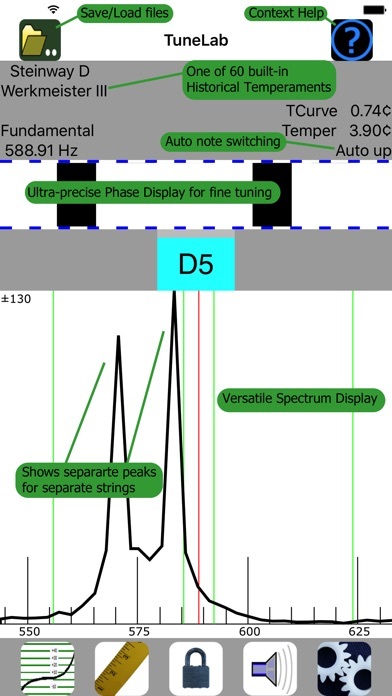 The spectrum display makes it possible to do rough tuning without mutes, since each string of a unison produces its own peak in the graph. Having both the Phase Display and the Spectrum Display visible at the same time gives you a more complete picture of the tuning than any single spinner-type or needle-type display. I am a long time “by ear only” professional piano technician who started using TuneLab a decade ago just for experimenting. This is not a “do it yourself” tuning app for pianos. It is an excellent measuring tool for real piano technicians who already understand the fundamentals of piano tuning. Everyone has their preferences, but it is in the same league as Verituner and CyberTuner, other pro apps in the pricing stratosphere. It is especially useful for pitch raising and tuning in noisy environments. I recommend it. I have been tuning pianos for over 15 years. This is by far the ONLY tuning app a pro tuner should have. Anything else doesn’t compare. 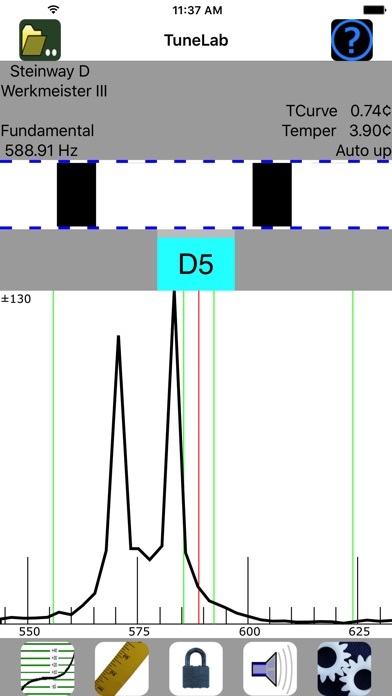 The spectrum analyzer makes it easy to tune without mutes if you wish. Bravo TuneLab. Bravo! The best there is for tuning pianos in iOS. This app is great. It sets a beautiful temperament, stretches the piano quite nicely, and you get smooth progressions of all intervals of increasing beat rates as you go up the piano. The over pull feature works well. I had been using the free Entropy Piano Tuner app for awhile, and it got to the point where my ear could set a better temperament than it did, so I invested in TuneLab. I have been happy ever since. Very good for the price. Be sure to read the user manual before using, though. Just a few requests: Better UI. The app works beautifully, but it doesen't look very beautiful. A little prettier please! Other cloud support. Dropbox works well, but I would love to be able to save my tuning files to OneDrive, my primary cloud storage source. Google drive, iCloud Drive, OneDrive support needed for greater flexibility. My clock disappeared. I don't wear a watch when I tune. Please bring back my clock. I've been using this app for 4-5 years now. Can't imagine tuning pianos without it! Just make sure you understand it fully and know how to set it up! I've used nearly all of the professional piano tuning devices over the past 20 years, then it was machines, now it's mostly apps. I am an RPT, aural tuner by training, and a full time Tech. I wanted to give Tune Lab a try because the price was good, it offered some unique features, and I heard good things about it. I've had the app now 2 weeks, and so far so good. It's user friendly, versatile, and extremely sensitive. There's other very good programs for more money, but for me the value is here. My favorite thing about it over some others is it's stable note switching ability. It's ability to hear the necessary partials and still stay on sequence is a welcome attribute. I did a full semitone pitch raise yesterday and the over pull feature saved me so much time. Definitely worth the money. I'm just an amateur tuner and this works great for me! there was an old piano at school that was way out of tune. im not a piano tuner, but ive read things here and there and have basic tuning equipment. ive fixed unisons on my piano in the past. i tried to tune this old piano by ear, but i couldnt get it to sound quite right. i tried using a free tuning app, and it actually made it worse. then i bought this app for 300 dollars. i was skeptical, but it is totally worth it. the old piano sounds great now. amazing. if you need to tune a piano, buy this.